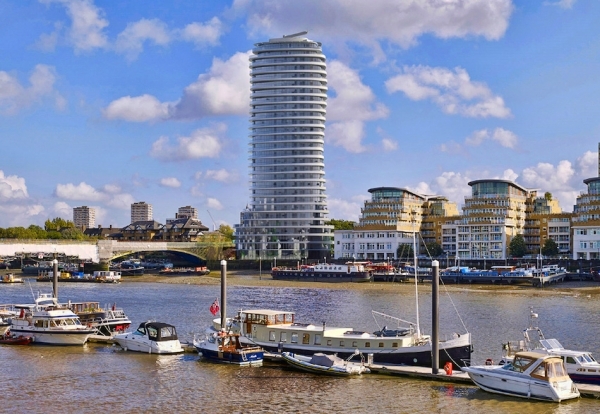 Barratt London is preparing to start construction of a 28-storey twisting tower on one of the last remaining Thames riverfront sites in Wandsworth. Enabling and piling works will get underway this month after the developer gained full planning for the 135 apartment scheme at Lombard Wharf, adjacent to the Grade II listed Cremone Bridge. Barratt London has allocated 20% of the apartments for on-site ‘affordable’ housing and is committing £1.6m to improve local infrastructure. Designed by local architects Patel Taylor, wraparound balconies, rotated at an angle of two degrees, appear as a series of ‘rotating discs’. This optical twist is achieved by the diagonal lines of tapered solid balustrades jutting against the horizontal lines of the balconies. Homes will achieve Code for Sustainable Homes Level 4 and a BREEAM Excellent Rating. 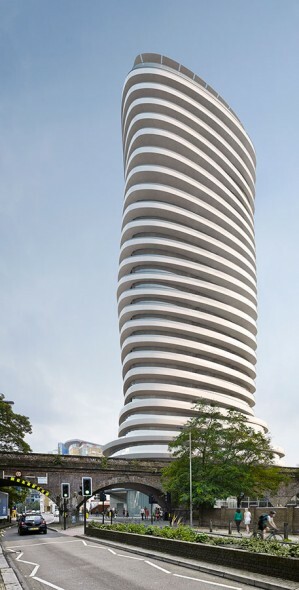 The ground level features a double-height glazed residential lobby and a riverfront retail unit. The mezzanine level contains a second floor to the retail unit, a gym for residents, staff facilities and management welfare facilities. Bays for 30 cars and 182 bicycle spaces are provided at basement level.